Cocoa V: New NYC Vegan Chocolate Bar! Vegans, who avoid all animal products, must read the fine print when it comes to chocolate because even the darkest bittersweet may contain milk solids. 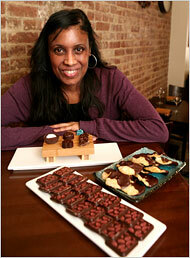 Pamela Blackwell, above, an owner of the vegan restaurants Blossom in Chelsea and Blossom Cafe on the Upper West Side, has given them a place, Cocoa V, to ease their concerns: two narrow brick-walled spaces, one a vegan dessert and wine bar and, next door, a shop. The chocolates created by Patrick Coston, her pastry chef, are made with organic cocoa, cocoa butter, soy lecithin and sugar or agave syrup. They are dark, smooth and intense. In the wine bar, which is outfitted with low tables, chocolates, brownies and savories like dairy-free “cheeses,” quiche and tea sandwiches are served with wines, coffee, tea and satisfyingly intense hot chocolate. The store also sells the sweets, including bonbons for $2.75 each, and pastries. Cocoa V, 174 Ninth Avenue (21st Street), (212) 242-3339. Shoot!!! Does it all have lecithin in it? OMG!!! I just had the biggest holiday meal and am sooo full, but still just drooled when I clicked on that link! HOW DECADENT!! YUM!!! Of course 🙂 Michael and I are always munching on dark chocolate after dinner. So good!